1 Place raspberries, juice and honey in a medium bowl; crush berries using a fork. 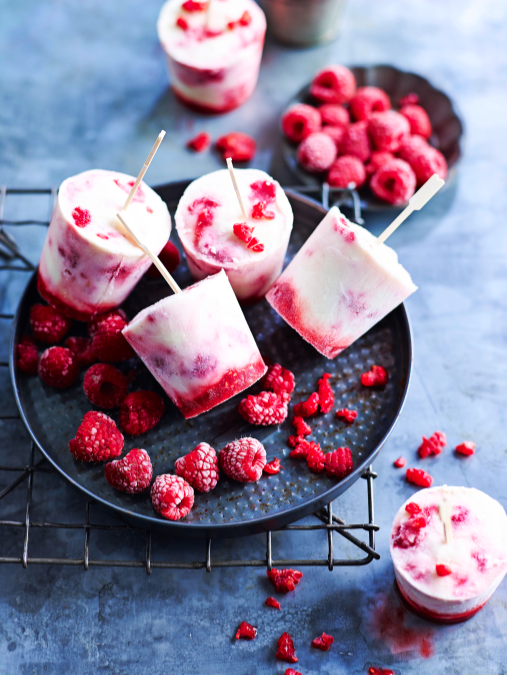 Spoon 1 tablespoon of the raspberry mixture into the base of each of 6 x 80ml (⅓-cup) dariole moulds or paper cups. Freeze for 1 hour or until firm. 2 Meanwhile, split vanilla pod in half lengthways; scrape seeds into a medium bowl. Whisk in yoghurt, rind and extra honey until combined. Fold in remaining raspberry mixture to form a ripple effect. 3 Divide mixture between moulds; insert a pop stick into each. Freeze for two hours or overnight, until firm. 4 Dip moulds quickly in hot water to turn out to serve.